We paddled a section of the Monocacy River, starting at Buckeystown Community Park in Adamstown, MD and going to the Monocacy Boat Ramp at the Mouth of the Monocacy River in Dickerson, MD on Saturday July 16, 2016. We put in at Buckeystown Community Park, which is at Route 80 and the Monocacy River. There is a port-a-potty and a playground there, but no boat ramp. We found a put-in where someone had chopped in steps in a steep muddy bank. It was about 8-10 vertical feet down to the river. By 10:30 am, on a Saturday, all the parking spaces were taken and families were starting to grill out. By the time we ran the shuttle to retrieve the cars at the put-in around 4:00 pm, the park was full of people and many people were parking on the street. This trip was put together at the last minute when a canoe trip and overnight camping fell apart as families dropped out for other commitments. So I can’t say that I did the most thorough job planning this trip. According to Ed Gertler’s book, “Maryland and Delaware Canoe Trails“, the trip is 9.6 miles. Ed estimates that it takes 17 hours to run 57.3 miles of the Monocacy River in Maryland. I extrapolated that you can canoe 3.3 miles per hour, not including breaks, lunch and swimming. So with a distance of 9.6 miles that would take a solid 3 hours of paddling. That was longer than I hoped to paddle (with kids), but I didn’t find a for sure place to put-in located where I wanted to in my limited research. I’m doing a little “after the trip” research, now that I have run it to help me remember the parts I liked best about the trip. 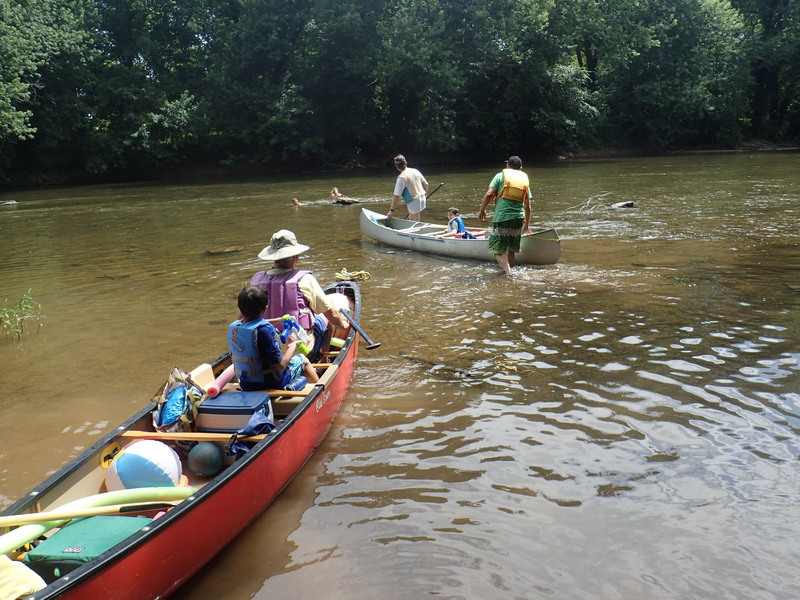 First off, I considered water level, and thought that the chances of being able to paddle the Monocacy in the middle of the summer were best if we paddled near the mouth of the Monocacy where there would be more water and a wider river. This proved correct. On my post-paddle research, I note that Ed Gertler says that to determine if the river has enough water to paddle (minimum water level) that the gauge: MONOCACY RIVER AT JUG BRIDGE NEAR FREDERICK, MD is 1.7 feet. This is the listing of the gauges in Maryland, from the USGS. The gauges on the Monocacy River are under the heading “Potomac River Basin (Harper’s Ferry to Washington)”. You can do historical research on the water gauges, so on Saturday July 16, 2016 at noon, the water level was 1.8 feet, enough to paddle, but low water. This is what I was expecting before and confirmed by paddling it. Since I didn’t check the gauge before, I’m just confirming what I found and the information in Ed’s book is correct about water level. The first half of the trip was all class A, moving water but no rapids. It is a lazy river and with lazy rivers, you have to paddle them versus float them. The second half the trip was mainly class A (flat water), but had several Class I rapids which are “Fast moving water with riffles and small waves. Few obstructions, all obvious and easily missed with little training. Risk to swimmers is slight; self-rescue is easy.” Here is the International Scale of River Difficulty. Ed Gertler rates the scenery along the river as Fair to Good and I would concur. But Phil, one of the adults with us (who had never done a downriver paddle) thought the scenery was excellent. Most of the paddle of the Monocacy is along private property. We saw some swimmers and fisherman every so often, but no other boats besides those with us until the take out. Most of this section (at this level) was pretty shallow. Some of it had deeper pools, and other parts were pretty shallow. The only maneuvering was during the last third of the trip where the rapids (Class I) came in and the bridges all had huge tree strainers. But there were always places to pass and avoid those strainers. As usual we brought squirt guns and pool noodles and a beach ball. The squirt guns were used quite a bit and the pool noodles were used by the kids when swimming. We lunched soon after we put in on a spit of rocks. There were many nice places to stop and rest and other nice places to swim and float. With so much paddling to do, we didn’t have time for the beach ball. With other access points, we could shorten the trip. The main access point we saw while paddling is a boat ramp at Park Mills Road. The trip is 3.8 miles from the Monocacy Boat Ramp at Park Mills Road to the Mouth of Monocacy. This would have most of the Class I rapids in this part of the trip. A boat ramp makes an easy put-in or take out, as it is paved and easily accessible. The other possible access point, which we did not see from the river and contains no place to park (except along the road) and no boat ramp, but access to the river is on South Crissford Road, Adamstown, MD. I think the real name is South Criss Ford Road, as noted in “Maryland and Delaware Canoe Trails”, but google thinks it is Crissford, so if you need to look it up on Google, then you need to spell it as Google knows how to spell it. I can’t tell from Google Maps how easy it is to put in a boat at this location. If you put in at Crissford Road the paddle is 6.3 miles until the Mouth of Monocacy boat ramp. The road that goes across the Monocacy at this point is Lily Pons Road. If you want to avoid most of the rapids, you can put in at Buckeystown Community Park and take out at South Crissford Road (3.3 mile paddle) or take out at Park Mills Road (5.8 mile paddle). I found the access point in Ed’s book, but also by Google Maps Satellite View. You can see a car parked along the road on the river side. This is the first trip (as a family) that we have had to run a shuttle. If you are a paddler, then I can say it is quite different to run shuttles with families, than it is just a few other whitewater kayakers. First off, we had 3 canoes but no car which could hold extra boats. (Well, our car can take 2 canoes, but it is a tall SUV and it pretty hard to get that extra boat up on the rack – because it has to sit at an angle). And then we had 10 people in 3 canoes (and 4 cars). Because of this and the fact that Mark in the extra car (no boat) was coming from Southern Maryland, (much further away than the rest of us), I gave Mark a meet time later than anyone else so that he could meet us at the put-in without shuttling his car. This all means that we had to run the shuttle twice. Once at the beginning and once at the end. With extra passengers and canoes, it may be the way it is with families. 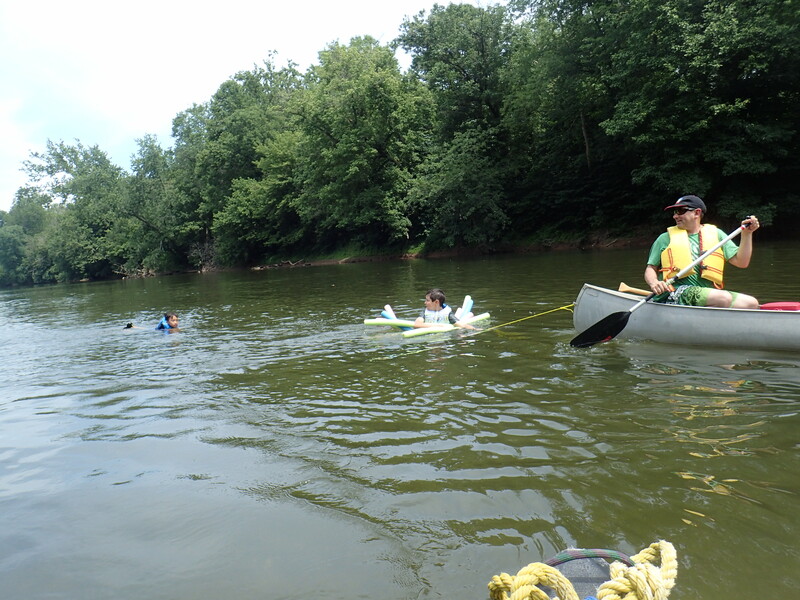 The kids mostly wanted to play versus paddle, so a shorter trip would have been a better solution for this group. We paddled the last one-third of the trip straight with no breaks. We started hearing thunder close to the end and needed to get off the river as soon as possible. It was lightly raining by the time we got to the Mouth of the Monocacy take-out. And even though we had put dry clothes in a car that was at the take out, we didn’t put them on as we had to stand in the rain until the cars came back from the shuttle. One really big thunder clap with lightning, sent us all to sit in Phil’s car (7 of us) until the shuttle cars returned. This was a very nice paddle. I would choose a shorter distance next time. The swimming was superb and the paddling got more interesting toward the end of the trip. 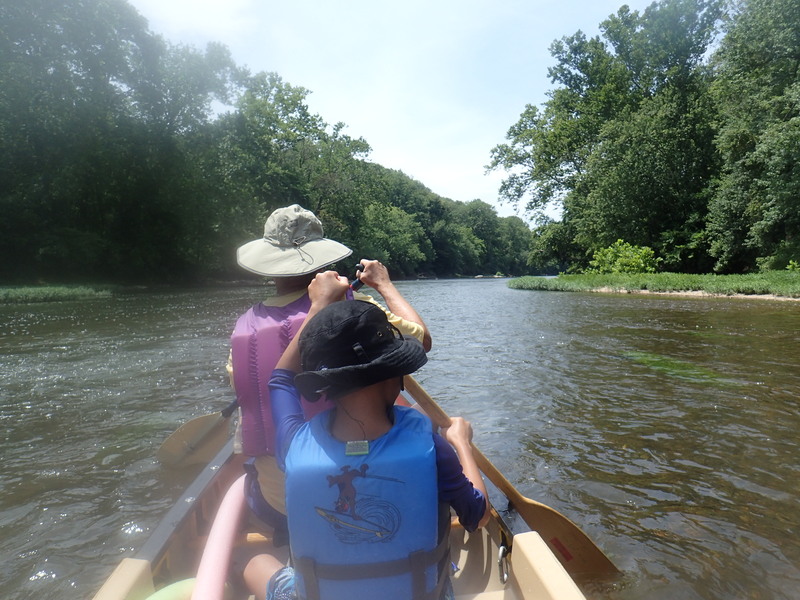 This entry was posted in canoeing, children, kayaking, Maryland, Trip Report and tagged canoeing, family canoeing, kayaking, Maryland canoeing, Monocacy River, Trip Report. Bookmark the permalink.